Laser Cut fastener mounting plate for inside of wheel pant. 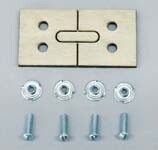 Drill aluminum gear to pattern, use provided fasteners to engage T-Nuts you've installed in mounting plate. Pack: 1 pair. Each ply mount is 1 Inch square. All hardware in photo is provided.